Mexican food lovers would have probably come across the enchilada. 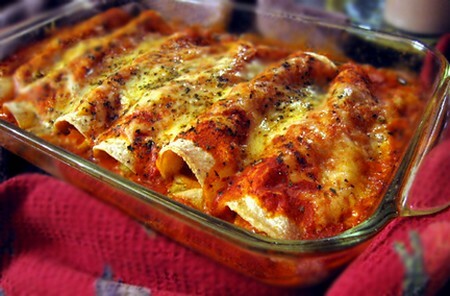 Enchiladas today are not only available at purely Mexican food outlets but can be found at restaurants that offer Tex-Mex specialties, diners and even many supermarkets sell either frozen enchiladas to make it quickly – using a microwave or they sell a package of ingredients that can help you to make several enchiladas for an easy family meal. An Enchilada is purely a corn tortilla that is rolled around meat and cheese. Many top it with a spicy chili sauce or top it with onions, cheese, sour cream, beans, nacho cheese, guacamole, etc. It is similar to a taco, the enchilada can be made with a wide variety of ingredients, whether it is chicken, steak, fish, etc and a variety of cheeses, beans vegetables, etc. It is an extremely versatile dish and many find it pretty tasty. There is a lot of evidence to suggest that enchiladas come from the Mayans. The dish was first associated with the region of Mexico by the Yucatan in pre-Columbian days. Corn tortillas were a staple of the Mayan people and there is evidence that basically the first enchiladas were tortillas that had fish rolled in it. 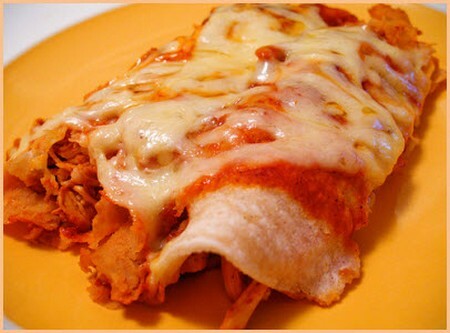 The enchilada is similar to papadzules which is a traditional Mayan dish and it also comes from the Yucatan region. This dish is made of corn tortillas which are dipped in pumpkinseed and rolled around chopped boiled egg, it is then smothered in tomato sauce. This dish was primary food for the nobles and was said to be served on special occasions. When the Spanish conquerors made their way to the Western Hemisphere they documented the variety of foods eaten by the indigenous people. Tortillas made from flattened corn bread were originally called ‘Tlaxcalli’, however it was the Spanish conquerors that named it the tortilla. Throughout the later centuries, the Mexican people continued to enjoy this dish and the enchilada can be found in a wide variety of cook books dating all the way back to the first Mexican cook book which was published in 1831 called El Cocinero Mexicano or The Mexican Chef. Today with the internationalization of food, many chefs are always keen to look for the best foods of each culture to share with their friends and customers. It is no wonder that the enchilada has earned wide praise from many food lovers around the world, it is not only tasty but nutritional and extremely versatile making it a great item to serve. In addition over the years, many Mexicans immigrated to the US bringing their culture with them that included their delicious foods. Today, the enchilada and other great Mexican foods are continuing to grow in popularity because of it’s easy to make ingredients and plenty of ways to prepare it. It can be expected to continue to see the enchilada in our neighborhood served in its many forms.